Of course, I immediately filled the table back up again with the next two projects, but for a few moments, all was tidy and serene in my little corner of hobbydom. For the last several years, I've always gotten together with my buddy Dave Coltman for a game over the holidays. Today we were able to hook up over a Command & Colors Ancients battlefield. Whenever we play C&CA, we always play twice and switch sides, with the winner being the fellow with the biggest victory banner differential. 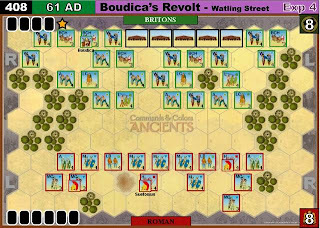 Today's scenario was Boudica's Revolt, 61 AD. C&CA is a great game. One of the reasons I love it is that the scenarios are rarely balanced. As such, they play out with a very historical flavor (i.e. the winner wins). So winning, per se, is always a matter of degrees. The set up. This scenario is invariably a Roman win. Dave took the British during the first match. Here he is contemplating his opening move, which will be a right flank activation to get Boudica into the battle. Dave wound up winning the day with a total of 12 banners to 9. Good games! Back at the hobby table, I have two projects going. I really want to get my Space Hulk Genestealers finished up. Elliot and I are already 4 games into our 12 game campaign...and I've been using his alien minis. I want to be able to use my own! Our campaign match is currently tied 2-2. 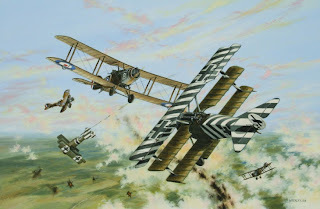 And for the next bout of WWI Canvas Eagles insanity, I'm taking on 8 Albatros D.Vs. I'm about a third of the way into the project right now, and I'll start the series of build posts next week. 'Til then, Happy New Year! 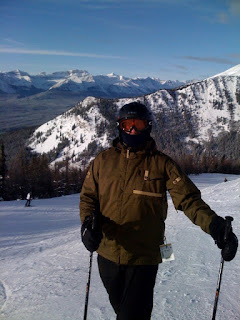 My wife and I are spending Christmas in Banff, so I'm skiing instead of modeling and painting. No problem...I have several projects on the table back at home and I'll update next week. First off, I'm painting up all my Space Hulk aliens. Second, I have an insane new WWI modeling project...even bigger than the last one. Details on the way. I hope everyone has a great Christmas day. A fictional dogfight between C Flight, 56 Squadron and a kette of triplanes from Jasta 19 formed the backdrop for our club's eight-player Canvas Eagles game last night. Kevin, Bob, Terry and Chris played the allied pilots, while Elliot, Matt, Andy and Chen-song played the Germans. This turned out to be a swirling dogfight, with most of the planes taking plenty of damage (and there were lots of wounded pilots). In the end, the British lost two aircraft and the Germans one, with the allies losing an additional plane down under control behind enemy lines. The low-light for me was setting Andy's plane on fire when he only had two fuselage damage boxes remaining...and having it burn for FIVE turns. Five damage chits later, no additional fuselage hits were delivered and the fire went out. Andy then promptly collided with Bob's SE5a and went down. Robbed! A few turns later, Andy had brought on a new plane, lined my plane up for a close range shot and promptly delivered a "Pilot Killed" damage chit result. Aargh. Here's is Andy's plane on fire. I managed to get pilot figures into all of the German planes before game time...now I have to paint up a few more for the next time the SE5as hit the table. Well, I can finally put this project to bed. It's been the better part of a month, but the six Fokker Dr.Is are ready to hit the game table this coming Tuesday night. This build took about twice as long as the last group of SE5as I did, mainly because there was so much paint masking and decal work. As an example, one Jasta 19 triplane fuselage side would get a base coat of white primer, then a mask for the iron cross field, then a spray of desert sand (for the linen color), then the iron cross decal. Next there would be a light overpainting of olive for the cross, then the streak decal, then the serial number and finally the decal for the fuselage personal marking. In other words...it took a while! Here the build is almost done...just waiting for landing gear, tail skid and propeller. The builds are done now. Kirschstein's optical illusion plane from Jasta 6 is in the back left. The five Jasta 19 planes from early April, 1918 round out the shot. Another view, this time from the front quarter. I'm running a Canvas Eagles game at the club on Tuesday, so I'll post some pics on Wednesday. 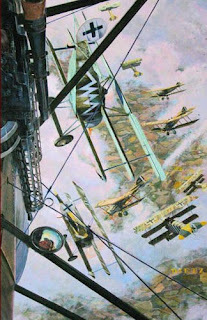 A final inspirational Jasta 19 painting...here Korner is diving on some English Bristol Fighters (even though at this time, these pilots were mostly fighting French opponents). For the first time in a few weeks, I'm feeling like there is light at the end of the tunnel. The five Jasta 19 triplanes, and Kirschstein's Jasta 6 machine are starting to take shape. This past week has been mayhem...the hobby table has been a jumble of wings, tailplanes and half-painted fuselages. At this stage I was prepping the fuselage cross fields. Jasta 19 overpainted their iron crosses to make these markings blend in with the surrounding camouflage fabric, and create an even background for the individual pilot markings. Here, I'm just starting to work on Krischstein's fuselage bands. At the end of this week you can see that all the major decaling work is done...and there was a lot of it! Final assembly over the coming week, and then these six Canvas Eagles miniatures should be ready for the game table.